It’s been so long ago but it’s close to 30 years. I bought my first stamp in a stamp store at Pier 39 in San Francisco and I haven’t stopped…I am a stampaholic! There are so many but I’d have to say it’s a toss-up between sponging and coloring. I use the Distress Inks for sponging and love the look. As for coloring, I have always loved to color and there are so many different types of markers, pencils and paints available today and each gives a different look so I like to experiment. My favorite color is purple and I do use it a lot in card making but it really depends on what I’m stamping. For florals I like to use pink, yellow, purple and red. But I also like black and white and red, black and gold. There are so many but I’d say geishas, florals, dragonflies and butterflies. Die cutting machine and dies. Can’t get enough of those dies. It would have to be my Genesis Paper Trimmer. It was quite costly and I saved for a long time but I would be lost without it. Don’t be afraid to try something new or ask for help if you’re struggling with something, that’s what OSA is all about…helping and encouraging each other. Check out the OSA galleries we have so many talented members. If something doesn’t turn out the way you thought it would don’t be discouraged try again after all it’s only paper. I love the beauty of the simplicity of it. I used to buy a number of magazines but I don’t anymore. I do visit a number of blogs and also Pinterest where there are so many wonderful card ideas. I love to read, anything to do with paper, ink and dies, and I have a habit of collecting too much stamping stuff. I have been a member of the Oriental Sketch Design Team for the last year and on the Tutorial Time Design Team since February for Mark’s Finest Papers, a Heinrich Co., one of our OSA Elite Vendors. I feel very blessed to be a part of their team and I am enjoying the experience. The beauty of the world around us. Absolutely none, I have trouble drawing stick people, therefore I stamp. There are so many wonderful sites but we have so many fantastic artists right here in our own OSA group, just take a look. As I stated earlier I do enjoy Pinterest but have to be careful that I don’t spend too much time looking because then I lose out on stamping time. I also think You Tube is great because if you’re looking for instruction for a specific project you will definitely find it there. I retired in December of 2004 and haven’t looked back since. I do volunteer at our local hospital. My husband Duane and I celebrated our 36th anniversary this year and have lived in Oroville, California, a small northern California town, since 1979. I have 3 sons, 2 step-sons and 2 step-daughters. We have 15 grandchildren and 4 great-grandchildren which bring great joy to us. Unfortunately they don’t live close to us so we don’t get to see them very often but we do get pictures and talk often so that helps us keep connected. Thank you for the honor of being selected as OSA September Stamper of the Month. •Stamps – Oriental Joy, Asian Delights, Branch of Blossoms & Lotus Blossoms from Mark’s Finest Papers, a Heinrich Co.
1. Remove the labels from the top and bottom of the box. 2. Stamp images with Memento Tuxedo Black ink on cardstock of choice. 3. Stamp just the butterfly again and cut it out to pop it up with dimensionals. 4. Using your choice of coloring medium color all the images. I used Copic markers and then added the Wink of Stella Clear Glitter Pen on each of the flowers and the butterfly. 5. 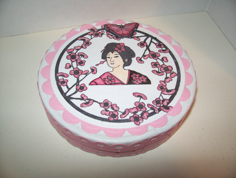 Using the largest standard circle die cut the Circle of Blossoms and Asian delights image. 6. Cut two of the largest scalloped circles, one for the cover and one for the inside of the bottom of the box. 7. Adhere the large stamped die cut circle to one of the scalloped circles and adhere to the top of the box. Cut out the extra butterfly and attach with dimensionals for a 3-D effect. 8. Stamp the Branch of Blossoms image on the second scalloped circle. Since it is on the pink cardstock I only added the Wink of Stella Clear Glitter pen and did not color the image. 9. Stamp sentiment on the 1 ¾” circle, adhere to the 2” scallop circle and adhere to the large scalloped circle. Adhere large scalloped circle to the bottom of the box. 10. Using your choice of a border punch cut the border and adhere to the top of the lid along the edge and along the edge of the bottom of the box. I hope you’ll give this a try it was fun and it’s a good way to recycle too. Congratulations Barbie on being SAM of september, enjoy your month of OSA-fame. You made a wonderfull project. Congratulations Barbie – you are such an asset to OSA . Congratulations Barbie! A well deserved honor being named Stamp Art of the Month for September. Loved reading your profile and learning more about you! Your project is awesome…can’t wait to try it! Enjoy your month in the limelight and once again, Congratulations! Barbie — Congratulations for being named the stamp artist this month! You are very talented and I love all your art projects. Barbie, congratulations! It is always a joy to read about one of our members nominated for SAM, and your bio is delightful. Thirty years of stamping, no doubt, seems like yesterday. Your cards are always stunning and OSA is fortunate to have you as a member. I look forward to more stunning projects and cards created Barbie style. no one deserves this recognition more than YOU. Congratulations and best wishes for this month about you. Love the recycling project. Congrats Barbie!!!! You so deserve this honor. I love seeing your projects. Hi Barbie – Congratulations on being this month’s SAM! I love your project. Congratulations Barbie! Your project is beautiful!